This is “Emerging China”, section 10.2 from the book Regional Geography of the World: Globalization, People, and Places (v. 1.0). For details on it (including licensing), click here. Summarize the main steps China has taken to transition from a strict Communist country established in 1949 to a more open society with a capitalist type of economy today. 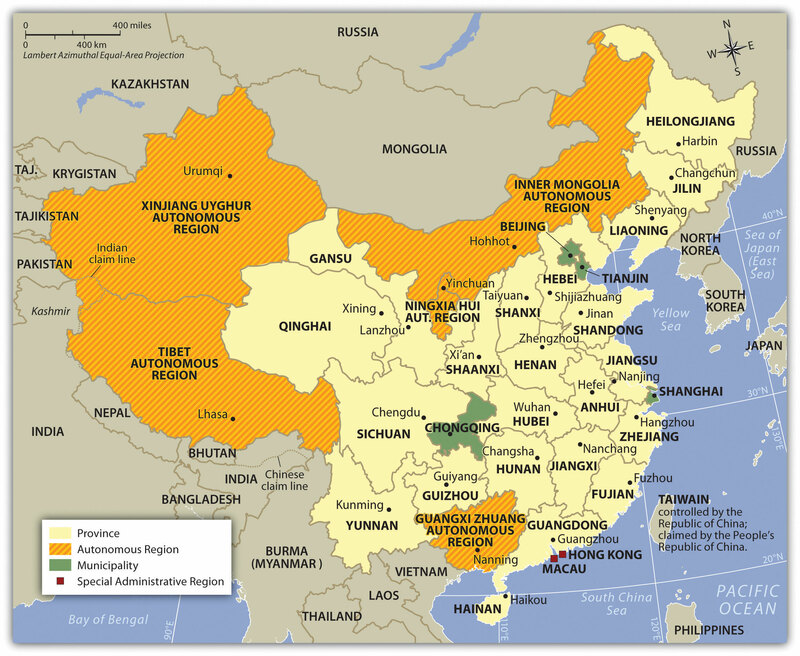 Outline the location of the political units of China with the autonomous regions and special administrative units. Establish the connection between the autonomous regions and ethnicity. Understand the population dynamics of China. Learn about the one-child-only policy and evaluate how it has affected Chinese society and culture. Describe how China has shifted its economic policies and structure in the past few decades. Outline the changes in economic development with China’s open door to Western trade. Sketch out the historical geopolitical objectives of China and how they relate to China today. China is the world’s largest Communist country. Isolated from Europeans and Central Asians by the Himalayas and other high mountain ranges, Chinese culture has endured for thousands of years. Rich in history, adventure, and intrigue, a tour through China would reveal a people with a deep, longstanding love of the land, traditions as old as recorded history, and a spirit of commerce and hard work that sustains them to this day. China is about the same land size as the United States, although technically it is slightly smaller than the United States in total area, depending on how land and water areas are calculated. China only has an eastern coast, whereas the United States has both an eastern and a western coast. If you recall the climate types and the relationship between climate and population, you can deduce the location of the heavily populated regions of China. The form of Communism promoted by Mao Zedong was not the same as the type of Communism practiced in the Soviet Union. Various Communist experiments were forced upon the Chinese people, with disastrous results. For example, in 1958, the Great Leap Forward was announced. In this program, people were divided into communes, and peasant armies were to work the land while citizens were asked to donate their pots and pans to produce scrap metal and increase the country’s industrial output. The goal was to improve production and increase efficiency. The opposite occurred, and millions of Chinese died of starvation during this era. Another disaster began in 1966 and continued until Mao died in 1976. The Great Proletarian Cultural Revolution wreaked havoc on four thousand years of Chinese traditional culture in a purge of elitism and a drive toward total loyalty to the Communist Party. Armies of indoctrinated students were released into the countryside and the cities to report anyone opposing the party line. Schools were closed, universities were attacked, and intellectuals were killed. Anyone suspected of subversion might be tortured into signing a confession. Violence, anarchy, and economic disaster followed this onslaught of anti-Democratic terror. Estimates vary, but most sources indicate that about thirty million people lost their lives during the Mao Zedong era through purges, starvation, and conflict. During the early decades of Communism in China, all travel into or out of China was severely restricted by the so-called Bamboo CurtainPolitical policies in China restricting people from entering or leaving the country.. The United States had backed the nationalist movement during the Chinese Civil War and continued to support Chiang Kai-shek in Formosa (Taiwan). The United States did not recognize Communist China; the US embassy was in Taiwan, not in Beijing. As China was experiencing its disastrous experiments with Communism, the core economic areas of the world were advancing with commercial technology and high-tech electronics and sending rockets to the moon. China lagged behind in its industrial activities and became a country based on agriculture. A visit to China by US president Richard Nixon in 1972 signaled the opening of diplomatic relations with the United States and was also viewed as a Cold War move against the Soviet Union. Source: Photo on left © Thinkstock. Photo on right courtesy of Russ Bowling, http://www.flickr.com/photos/robphoto/2505049159. The Chinese Communist Party’s approach when it took power was to institute a “planned economy.” A planned economy, sometimes called a command economyAn economy in which economic decisions are made by a central authority and not according to market demands., stands in marked contrast to a market economyEconomy based on free market determining supply and demand.. In a planned economy, the government controls all aspects of the economy, including what goods and products should be produced, how much of each should be produced, how products will be sold or distributed and for what (if any) price, who should have jobs and what jobs they should have, how much people will be paid, and all other decisions related to the economy. In a planned economy, businesses are nationalized; that is, businesses are owned by the government rather than by any private entity. By contrast, in a market economy, businesses are privately owned, and most decisions are driven by consumer and investor behavior. The decade of the 1980s was a transition for China in that there was a shift of focus from China’s Communist economy to a more market-oriented economy. The economic collapse of the Soviet Union in the early 1990s coincided with the opening of China to trade with the West. In 1992, China announced that it would transition to a socialist market economy, a hybrid of a Communist-planned economy and a market economy. A series of statements by China’s political leaders suggested that in order for China to enjoy a more mature form of socialism, greater national wealth was needed. They further indicated that socialism and poverty should not be considered synonymous and that the country was ready to turn its attention to increasing the wealth and quality of life of its citizens. During the next decade, China experienced an enormous growth in its economy. At the beginning of this century, China was ranked in the top five of the world’s largest trading nations, joining ranks with the United States, Germany, Japan, and France. The sheer size of China’s population contributes to the magnitude of its economy. This does not, however, mean that most of China’s population has a high standard of living. China can be divided into regions utilizing various criteria: political regions, economic regions, natural regions, and climatic regions to name a few. The Communist government of the People’s Republic of China (PRC) is made up of a number of types of political units. The main region of China Proper includes twenty-two provinces, including the island province of Hainan in the south. The island formerly known as Formosa, now called Taiwan, is considered by China to be its twenty-third province but in actuality remains under its own government—the Republic of China (ROC). Mainland China includes five autonomous regions, each with a designated minority group; four municipalities; and two special administrative regions (SARs) that hold considerable autonomy. All but Taiwan are included in the region called mainland China, except the SARs Hong Kong and Macau. The autonomous regions exist as a kind of a compromise between China and the regions that would prefer to be totally independent and that have large non-Han or ethnic minority populations. These five autonomous regions are Tibet, Guangxi, Xinjiang, Inner Mongolia, and Ningxia. It should be noted that “autonomous” is how China would describe these regions, but that description is arguable. In reality, the autonomous regions have very little legal ability to govern themselves and, in fact, have in some ways less autonomy than the provinces to pass their own legislation. Four of China’s cities have governance structures that are roughly on par with that of the provinces. The directly controlled municipalities are Beijing, Tianjin, Shanghai, and Chongqing and encompass large geographic areas well beyond the city limits, including towns, villages, and rural areas. The two SARs of China are Hong Kong and Macau. Hong Kong was part of the British Empire and later a British protectorate until its governance reverted to China in 1997. Known informally under Chinese law as “one country, two systems,” Hong Kong and Macau are guaranteed a great degree of autonomy for at least the first fifty years after the transfer from Britain to China. China is responsible for defense and some portions of foreign affairs, while Hong Kong and Macau are responsible for most other matters of state, including their legal systems, law enforcement, immigration laws, monetary systems, customs policies, and others. China’s Communist government is controlled by the Chinese Communist Party, which is protected and guaranteed power by the country’s constitution. Compared to the more open democratic political systems of Western Europe and North America, China is considered an authoritarian state, complete with heavy restrictions on the Internet, the press, freedom of assembly, reproductive rights, and freedom of religion. Economic trade with the West has created more openness with travel and business, which has begun to challenge or erode the hard-line politics of decades past. With four thousand years of culture to build on, China continues to press forward into the twenty-first century. In 2010, China had more people than any other country in the world, about 1.33 billion. Most of its people live in China Proper, in the eastern regions of the country. China Proper has the best agricultural lands in the country, the most fertile river basins, and the most moderate climates. For perspective, China has over one billion more people than the United States, with most of those people living in the southeastern portion of China. During Mao’s time, there was little concern for population growth, but in recent decades China has implemented measures to deal with its teeming population. The government of China has taken the responsibility to address its growing population and the country’s ability to provide for the needs of the additional populace. 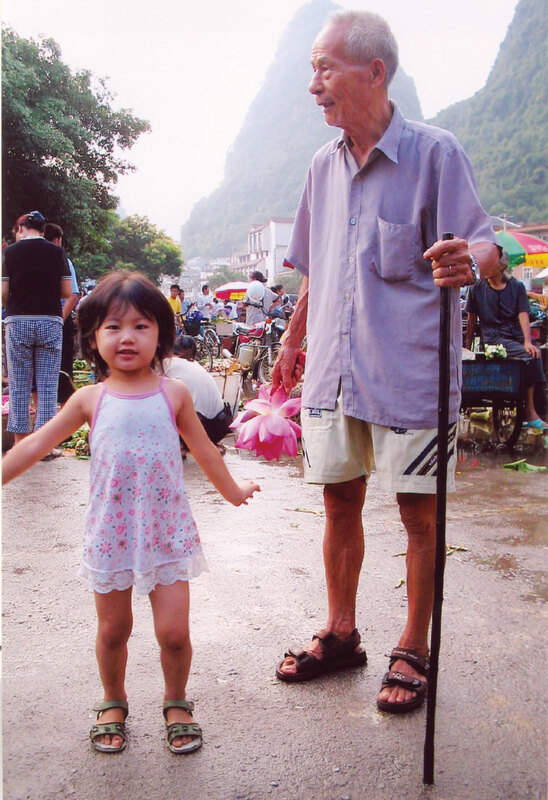 In 1978, China implemented the one-child-only statute, limiting family size to one child. The policy allows for exemptions under certain conditions. Couples living in rural areas and people of minority status are two examples of exempted conditions and may be permitted more than one child, especially if the first child is a girl. Peripheral administrative regions like Macau and Hong Kong are exempt. The one-child-only policy was implemented in an attempt to address environmental, economic, and social issues related to population growth. This policy has helped reduce China’s potential population by hundreds of millions of people, but the controversial policy has not been easy to implement or make effective. There are growing concerns regarding the policy’s negative impact on society. In response to the one-child-only policy, there have been reports of female infanticide and a higher number of abortions. However, surveys taken by independent agencies indicate that about three-fourths of China’s population supports it. Economic incentives pressure families to abide by the one-child-only policy. Government benefits and social programs offer incentives that may be lost if couples have more than one child. Enforcement of the policy has been left to the provincial authorities with varying levels of success. Parents eager to have a boy to carry on the family name might abort a female baby. Though now illegal, the use of ultrasound equipment to determine the gender of a fetus is widespread. Some provinces in China have a severe shortage of women because of the policy; men in provinces where women are scarce may have to migrate to find a wife. In China there are more boys born than girls; the ratio averages more than 10 percent more boys than girls, with some provinces reaching more than 25 percent. This imbalance creates cultural issues that may have a negative impact on traditional society. Conventional society is challenged when there are a large number of unmarried young men in an area that may not have adequate employment opportunities for them or available women for potential marriage. The one-child-only policy eliminates brothers, sisters, cousins, aunts, and uncles in an extended family. Source: Photo used by permission of Joyce Minor. More than 50 percent of China’s population lives in rural areas, meaning there is potential for high levels of rural-to-urban migration. The core industrial cities located in China Proper attract migrants in a periphery-to-core migration pattern. China hopes that this urbanization and industrial activity will also support their population control methods and fuel the industrial labor base. China’s urbanization increased at an unprecedented rate from 17 percent in 1978 to 47 percent in 2010. This rural-to-urban shift has been one of the largest in human history. It still continues; many workers shift from holding temporary employment in the cities to returning to their families in the countryside between jobs. Han Chinese is the largest ethnic group in China, with about 90 percent of the country’s population. 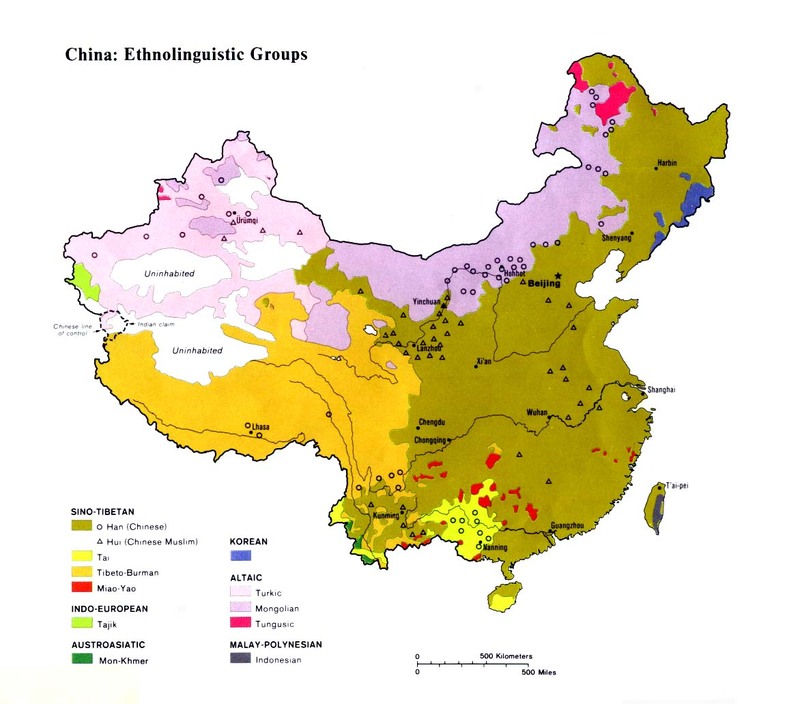 Some of the largest minority groups include Zhuang (Tai) in the south, Manchu in the northeast, Mongolian in the north central region, Uyghur in Western China, and Tibetan in Tibet, although many other minority groups exist. The main language in China, Mandarin, is spoken in different ways in different parts of the country, particularly in the north and the south. The number of languages in China (over 290) roughly corresponds to the number of ethnic groups in the country. In Western China, where the percentage of Han Chinese is quite low, most of the population is Uyghur, a group that tends to be Muslim. There are also Kazahks, Kyrgyz, and Tajiks from Central Asia, who are also predominantly Muslim. In 2010, the precise number of Muslims in China was not known, but government reports indicated there were about twenty-one million. Other reports indicate there may be three times that many. Minority groups like the Uyghurs have often experienced discrimination by the Chinese government, which has taken measures to marginalize minority groups to keep them in check. Source: Updated from map courtesy of University of Texas Libraries, http://www.lib.utexas.edu/maps/middle_east_and_asia/china_ethnolinguistic_83.jpg. As a Communist country, there is no official religion in China, nor is any supported by the Chinese government. Before Communism took control, most of the people followed a type of Buddhism. Other belief systems included Taoism and the teachings of Confucius. Christianity does exist in China, but it is illegal to proselytize or recruit converts. Despite that, the Christian population in China has grown rapidly in recent decades. The exact number is unknown, but the CIA World Factbook estimates 3 to 4 percent of the population to be Christian, or somewhere between thirty-nine and fifty-two million adherents. There are many other sects and religious groups in China that have gained attention in recent years. Among these are the followers of Falun Gong, which emerged in the 1990s and has elements of Buddhism and Taoism in its beliefs. The group claims to be more of a science than a religion. The Chinese government believes otherwise and banned the Falun Gong in 1999 after the group staged a large protest against the Communist Party. The crackdown by the government included many arrests and stiff prison sentences. The group is currently banned by the government. In the past two decades, China has shifted its economy from a closed system with a centrally planned, government-controlled market to one with more open trade and a flexible production structure. These economic reforms have allowed capitalistic tendencies to drive production, have promoted increased involvement in private enterprise, and have increased international investment in the Chinese economy. China has phased out collective farms and has increased agricultural production; the approach to free enterprise and international trade and investment has become more open; and the Chinese economy has grown at a rapid rate. Open trade and interaction with the global community have allowed China to catch up with the rest of the world in terms of information and communication technology, and computer and Internet use in China has opened up many sectors to new opportunities and employment possibilities. 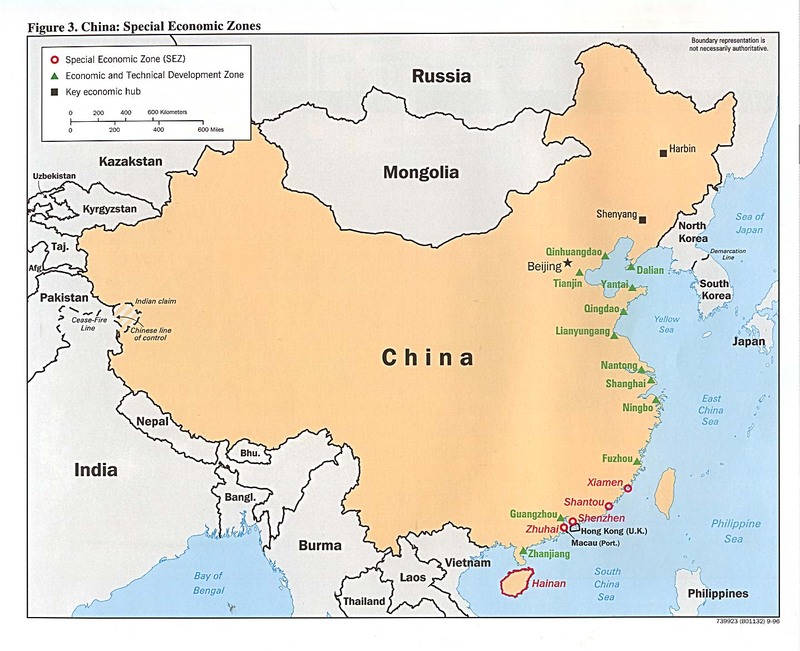 China’s policy of creating special economic zones (SEZs)Politically designated area where special economic rules or administrative policies are established to attract or encourage business and trade. has increased urban and economic growth in coastal cities, fueling the strong rural-to-urban shift in the population. Beijing, a metropolitan center of Chinese culture, is the capital of China. Freeway development has expanded in recent years as higher incomes have allowed for automobile purchases. 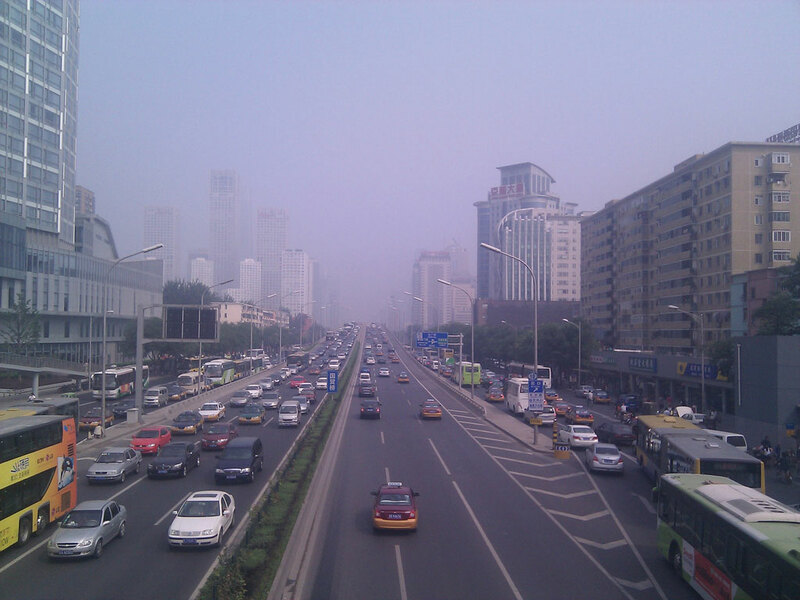 As a result, traffic congestion and air pollution are part of China’s current environment. Source: Photo courtesy of Jon Phillips, http://www.flickr.com/photos/jonphillips/4998737777. The fast-paced growth of the Chinese economy in the past decade has brought with it some negative consequences. The exploitation of resources and the heavy utilization of the environment have resulted in serious soil erosion and air pollution. The water table in many parts of China has decreased because of heavy demands on the nation’s water supply. Arable land is being lost to erosion and inadequate land-use practices. Rural areas have not received consideration or resources equal to the coastal cities, so conditions remain poor for most rural people. Half of China’s population earns the equivalent of a few dollars per day, while a fortunate few earn high salaries. Unemployment is at an elevated level for tens of millions of migrants who shift from location to location, looking for work. There is also an unfortunate degree of corruption within the government and state-run offices. Compared to Western countries, China is an authoritarian state that does not allow labor unions, free speech, freedom of religion, or freedom of the press. There has been more openness in China’s economic reforms and in travel, but other strict rules of the state remain. There is no minimum wage law for factory workers, who work long hours and do not receive benefits or sick leave. There are fewer safety requirements or government regulations for security. China is trying to have the best of both worlds: the efficiency of an authoritarian government and an efficient market-driven capitalist economy. Sustaining the largest standing army in the world, China is geared to become a global superpower. The next great world conflict could be a cultural war between the United States and China that would involve economic, political, and human issues. To work together, the United States and China would be well served to increase their understanding of each other. During the 1980s, following the death of Mao Zedong, China went through a transition period. The new leader, Deng Xiaoping, realized that in order for China to compete in the world market, its economy would have to be modernized. The challenge was to open up to the outside without the outside placing pressure on the Communist system inside of China. The so-called Bamboo Curtain, which referred to the restriction of movement of goods and people across Chinese borders, diminished. To attract business and tap into the global market economy, China established SEZs along the coast at strategic port cities. SEZs attracted international corporations who wanted to manufacture goods cheaply, while China’s population of 1.3 billion people provided an enormous labor pool and consumer market. China’s modernization efforts paid off in the 1990s, when world trade increased and US trade with China exploded. By the year 2000, China had profited greatly because of its expanded manufacturing capacity. The coastal cities and the SEZs had become core industrial centers, attracting enormous numbers of migrants—most of them poor agricultural workers—looking for work in the factories. Compared to other jobs, factory jobs are prized employment opportunities. Rural-to-urban shift has kicked in and China’s urban growth is occurring at unprecedented rates. Chinese people are moving to the cities looking for work, just like people in many other areas of the world. The SEZs encourage multinational corporations to move their overseas operations to China and take advantage of the lower labor and production costs. China benefits from the new business opportunities and by the creation of jobs for its citizens. SEZs operate under the objectives of providing tax incentives for foreign companies, exporting market-driven manufactured products, and creating joint partnerships so that everyone benefits. In the past decade, four main cities have been designated as SEZs, along with the entire province of Hainan Island to the south. Many coastal cities were also designated as development areas for industrial expansion. 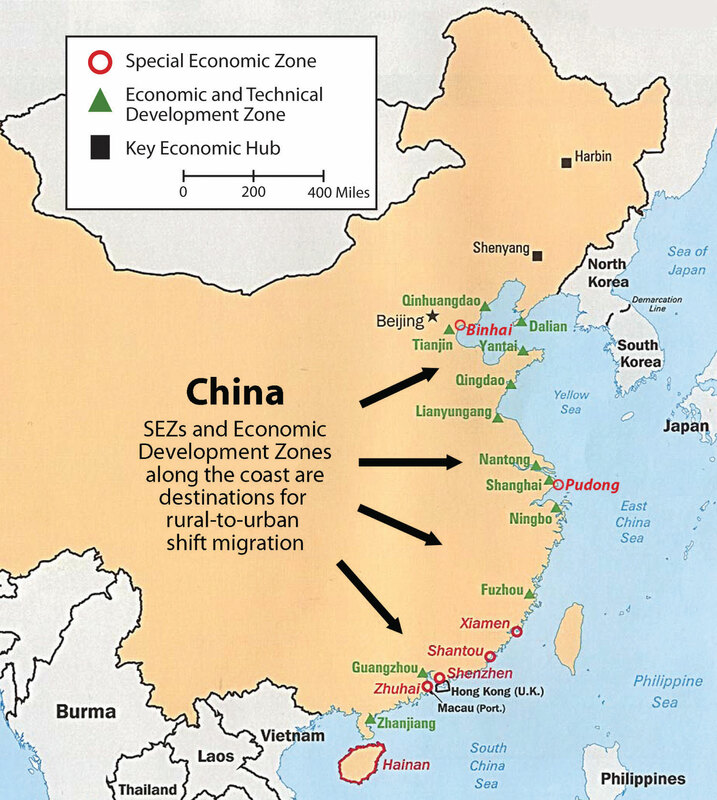 Coastal development and SEZs along the coast of China are prompting growth of the rural-to-urban shift. Source: Updated from map courtesy of University of Texas Libraries, http://www.lib.utexas.edu/maps/middle_east_and_asia/china_econ96.jpg. In 2006, the president of China called for an expansion of the economy to focus on more innovative activities. The government allowed additional funding for more research in the areas of genetics and gene therapy, computer software development, semiconductors, and alternative energy technologies. China has a high-level energy demand to fuel its expanding economy and provide for a large population, so alternative energy development has been expanding into wind and solar power for both domestic and commercial purposes. China’s industrial sector is advancing to compete in the global marketplace and muscle into the high-tech economy once dominated by core areas of Japan, Western Europe, and the United States. The political environment of China cannot be separated from its geography. To understand the larger political picture of China’s position in the world, one has to understand China’s geography. In terms of its land area, China is a large country. It includes an immense peripheral region surrounding China Proper consisting of minority populations and buffer states. The core of China is the Han Chinese heartland of China Proper. This is where most of the population lives and where the best agricultural land for food production is located. 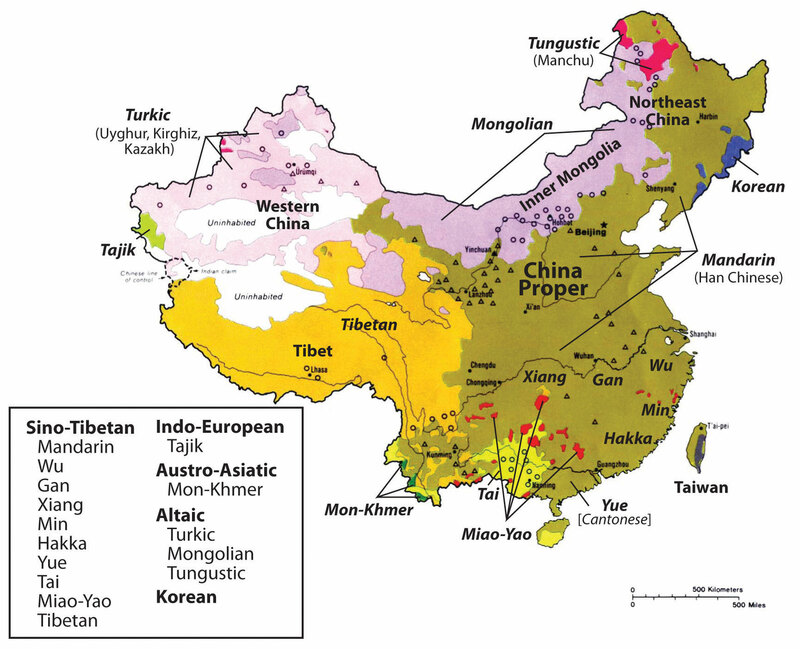 The surrounding periphery consists of autonomous regions and minority populations, including Tibet, Western China, Inner Mongolia, and Northwestern China. Tibet is a buffer state between China and India; high mountains provide a buffer between India and Tibet. Nepal, Bhutan, and Kashmir are also buffer states between China and South Asia. High mountain ranges extend all along China’s western boundary. Western China has a majority Muslim population closely aligned with ethnic groups in Central Asia. Inner Mongolia and the independent country of Mongolia create a buffer between China and Russia. China’s actual border with Russia is remote and distant. Northeast China was historically called Manchuria and is home to the Manchus, who are not Han Chinese. Even the isolated sovereign country of North Korea acts as a buffer between China and the world superpower of the United States through its surrogate South Korea. The border with Southeast Asia is mountainous with difficult terrain and very little access. All these buffer regions insulate the Han heartland from the outside. China’s powerbase is actually a territorial island insulated and isolated from the rest of the world. Technology and trade has opened links between the Han Chinese heartland and the global marketplace. In the scope of geopoliticsThe geography of international relations. (the study of the geography of international relations), the core of China is protected on all fronts except one, the eastern coast. Coastal China is accessible to anyone with a ship. Coastal China is where Japan and the European colonialists such as France, Great Britain, Portugal, and Germany all came to carve up China for their imperial advancements. Also located along the coast is the island of Taiwan with the independent government of the ROC. Taiwan has been on friendly terms with the United States, which has posed a threat to the Chinese mainland. The coast makes China vulnerable. The challenge for China has been to neutralize the coastal threat and reduce its vulnerability. This is where the SEZs make a difference: the Chinese economy has relied on the SEZs to attract foreign corporations to conduct their business with the Chinese in these coastal cities. The economic world has forged ties with the Chinese along China’s coastal waters. The extensive coastal development creates a situation where it is now in everyone’s best interest to make the coastal region of China safe and prosperous. In the geopolitical sense, China has historically operated under three main premises. The first premise is that China must secure a buffer zone in the periphery, which includes the regions along China’s borders. Second, the country needs to continue to maintain unity within the Han Chinese majority that anchors the core region of China Proper. The third component of China’s geopolitical strategy is to protect and secure its vulnerable coastal region. The country needs to find a way to marginalize outside influence and keep the heartland protected from invaders. These three geopolitical directives were designed before the postindustrial economy emerged with the information age, but the main themes of securing and protecting China remain. China has additional political issues within the core region of China Proper. To maintain a unified Han Chinese powerbase, there should not be uneven levels of equity in the standards of living within the core region. Manufacturing has rapidly increased in the coastal cities of the SEZs and other development areas. The standard of living in the coastal cities has improved, which has created a disparity between the coastal cities and the rural regions of the interior. Factory workers can earn the equivalent of fifty cents an hour, while their counterparts working in the fields in agriculture are only making the equivalent of a few dollars per day. As a Communist country, this was one of the basic foundational principles within a socialist society—the even distribution of wealth. It kept everyone on the same playing field, at least in theory. The more open capitalist economy is changing this and challenging the equality issue. China is also economically disproportionately reliant on its ability to maintain a high level of export manufacturing as its method of gaining wealth. The country does not have a type of geography that holds adequate agricultural resources to provide for its vast population. Manufacturing requires good political and economic relationships with the international community. In summary, China’s eastern coast development is a risk that China is forced to take. The risk is a trade-off. On one hand, the eastern coast is the most geopolitically vulnerable side of China, but on the other hand, it is where the most extensive economic gains have been made in recent years. China’s Bamboo Curtain has disappeared; the country is no longer isolated from the rest of the world. Economic development has created a strong degree of dependency on other countries through the doorways of China’s coastal cities. China is becoming dependent on the outside world for oil, raw materials, and technology. Multinational corporations are dependent on China for low-cost manufactured goods. China is becoming more integrated within the network of the global economy. China has embarked on a number of serious transitions since the Communist republic was declared in 1949. Since that time, the country has shifted from a command economy to a market economy and has opened up trade to the West. This has opened up more opportunities for the Chinese people as well. China has a number of autonomous regions and municipalities. Many of these political units are also home to minority ethnic groups. Han Chinese make up about 90 percent of the people of China. China’s large population has prompted the government to implement a one-child-only policy, which has resulted in a decrease in population growth but has also caused an imbalance in the percentages of boys and girls being born in many of the provinces. The creation of SEZs along the coast, and an open-trade policy, have rapidly developed China’s manufacturing sector. This trend has attracted multinational corporations to move their operations to China to tap into the low labor and overhead costs and receive tax incentives from the Chinese government. The result has been an increase in rural-to-urban shift in China’s population. China’s historical geopolitical situation was to secure a buffer around its heartland, unify the Han majority, and protect its venerable coastal region. Economic trade and interaction with the global economy has made China dependent on other countries for its continual economic success. What did the Bamboo Curtain refer to? How has China changed with regard to its Bamboo Curtain? What are SEZs? Where would we find them in China? Why are they located where they are located? Which region of China has the highest population density? Why do they live here rather than in other areas of China? What policy has China implemented to help curb population growth? What are some of the results of these policies? What are the five autonomous regions based on in China? Where are they located? Why did China shift from a command economy to a market economy? What are the main ethnic groups, languages, and religions in China? Considering current conditions, what are the major development patterns in China? Under what four main principles do the SEZs operate? What where the three main historical objectives in China’s geopolitical situation?